Aw, Krypto’s never looked better has he? A cow! 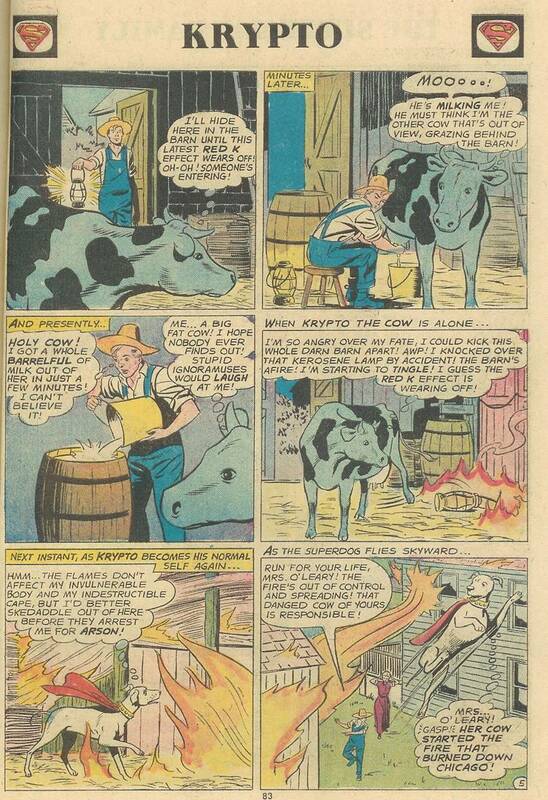 Then again, Lee and Kirby did the same thing later on in Fantastic Four #2, forcing the invading Skrulls to permanently take the forms of cows. So, if it’s good enough for Marvel, it must be good enough for DC. 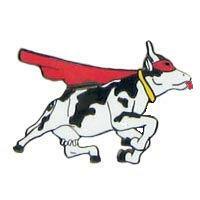 You know, one other point here is that Krypto is a male dog, yet he’s just been turned into a female cow, udder and all. I couldn’t picture them pulling that bit of gender bending on a regular Superman story, do you? Then again, maybe they have, I haven’t read every comic story out there. That’s right dear reader! 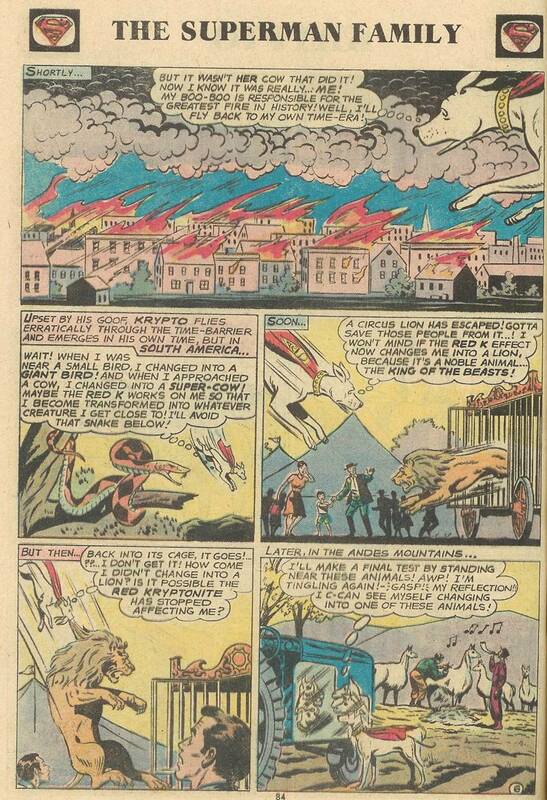 Krypto, hero to millions (of pets I’d guess) started the great Chicago fire of 1871! Not only that, he is a freakin’ superhero, yet he does absolutely nothing to stop the fire HE CAUSED!!! Man, you’d think that Superman would have instilled better qualities into his followers than that! So, what was the great Chicago fire? On Sunday evening, October 8th, 1871, Historians a fire started in the barn of Mr. and Mrs. Patrick and Catherine O'Leary. From there it turned into an unstoppable conflagration that, before finally dying out in the early morning of Tuesday, October 10, had cut a swath through Chicago approximately three and one-third square miles in size. Property valued at $192,000,000 was destroyed, 100,000 people were left homeless, and 300 people lost their lives. Strangely enough, the blaze spared the O'Leary home. Modern theory seems to contradict this story, however, citing several key points that exonerate Mrs. O’Leary. I refer you to the excellent website linked here for more information http://www.thechicagofire.com/ . He just left? That’s it? He doesn’t even try to save anybody? 300 people died in the fire that you caused you heartless, evil dog, and you turn your back on them? Does that make any sense to anyone out there? You know, if this story were created nowadays, that single event would be considered a turning point in Krypto’s life, and they’d create multiple storylines based on what dire psychological trauma Krypto must be undergoing because of it. Nightmares, angst, etc. – until that fateful day when the dog’s mind cracks and he enters the realm of super-villain by biting the super hand that feeds him. Isn’t that what happened to Hal (Green Lantern) Jordan back around Zero Hour, or Speedball from Civil War? Well, okay, they didn’t physically bite anybody’s hand, but the super-villain part seems accurate. Could you imagine Krypto as a super-villain? 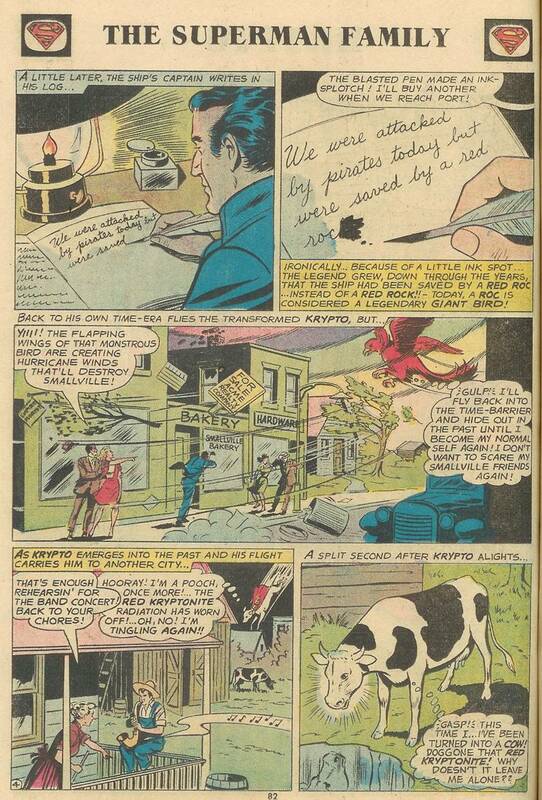 Of course he wouldn’t be Krypto anymore – he’d have to change his name and looks/costume. Could you imagine the throngs of people in the streets looking up high in the sky, pointing and yelling… BEWARE SUPERCOW and THE UDDERS OF DOOM!! !